From the lack of parking in front of the Cathedral, a safer Bigelow Boulevard crosswalk or the freshly painted white and yellow lines — the new bike lanes are pretty hard to miss. The City of Pittsburgh opened the lanes Aug. 15 on portions of Forbes Avenue and Bigelow Boulevard — a much-needed development as Oakland is the city’s second most-biked neighborhood, after Downtown. The lanes, which travel both directions on the two streets, will almost certainly help students and professionals around Oakland travel more safely throughout the neighborhood. But while the development will be useful now, the circumstance under which it happened paints a dangerous picture of Oakland for cyclists. Susan Hicks, a Pitt administrator, was struck by a car and killed in 2015 while riding her bicycle on Forbes Avenue at the Bellefield Avenue intersection. In Pennsylvania, this isn’t uncommon — a 2015 nationwide study found that cyclist fatality rates were up 12 percent that year. Building bike lanes isn’t the only step toward ending cyclist deaths. What’s important now is that drivers and cyclists alike know how to behave when they encounter bike lanes, and that the City of Pittsburgh continues to invest in making the roads safer for everyone. When driving in Oakland, especially during the school year, you must be alert. When cyclists and pedestrians flood the streets in between classes, a momentary lapse of concentration can have life-ending consequences. Remember — when on the roads, cyclists have the same legal rights as cars, and thus should be treated as such. And when cycling in Oakland, your behavior is just as important for your safety as drivers’ behavior is. The bike lanes are pretty simple, and are marked by the traditional double-yellow lines. When biking, keep the double-yellow lines to your left — you’ll avoid head-on bike collisions and stay a safe distance away from cars. Because the lanes are past the far right lane of car traffic, don’t try to drift to the left lane to make a turn. Instead, approach the light in the bike lane and wait for perpendicular traffic to be signaled. This traffic flow limits the risk of left-turning cyclists being hit from the left side by cars going straight. We all know that Oakland is complicated, confusing and dangerous to drive and bike through. But despite the high volume of traffic that pours through Oakland every day, it’s time to truly share the road. These bike lanes are an important first step in Oakland’s effort to become safer, but it shouldn’t stop there. 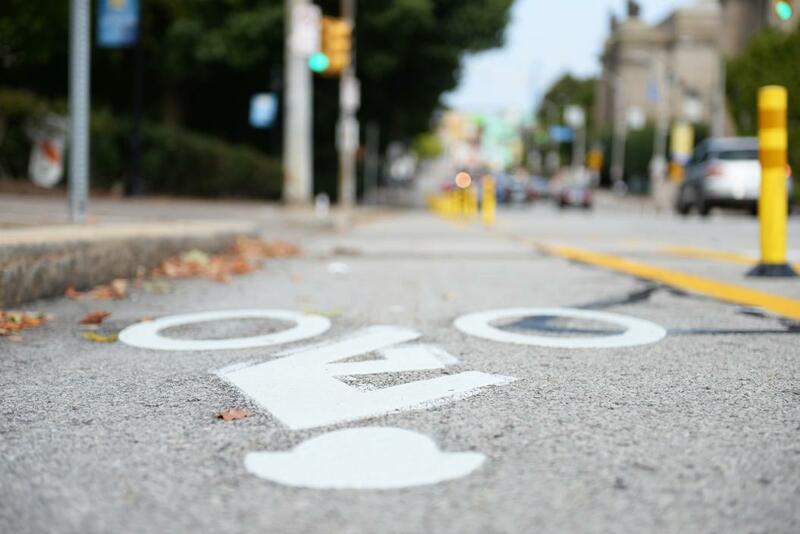 Bikers, drivers and pedestrians alike should continue to take steps to educate themselves through resources such as BikePGH and PennDOT, and Oakland should continue to be open to changes that will make people safer. As for Bigelow’s parking spaces? Sure, there are fewer — but no parking spot is worth the cost of a life.